Scotland's Dan Purvis delighted the home fans with a gold medal performance at the Gymnastics World Cup event in Glasgow's Kelvin Hall. "It was a bit of a shock to be honest," said Purvis, who trains in Southport. "Coming back from the Europeans I just wanted to have fun but I managed some clean routines and came first." But he added that he would not be resting on his laurels. "It'll be straight back to training on Monday," he continued. "I've still got quite a few competitions coming up so my aim is to just keep fit and at the same time continue to compete well." Gold in the women's competition went to Romanian teenager Amelia Racea, ahead of Venezuela's Jessica Lopez and another Romanian, Raluca Haidu. Gymnastics' international governing body introduced the revised World Cup format to showcase the world's top gymnasts in six events. 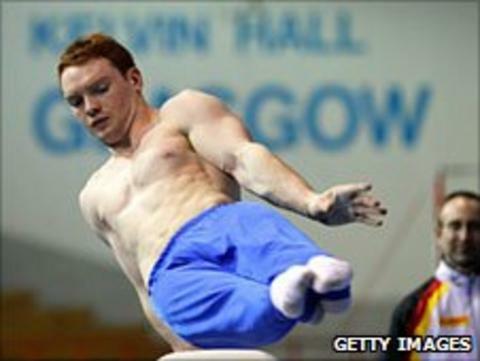 The Glasgow leg of the competition was one of four in which gymnasts will compete on every piece of apparatus - six for men, four for women - with one overall winner. There are two other World Cup legs featuring individual apparatus finals only.